establishment of a Person’s Act. cognizant of underlying forces, creeping. ourselves to been seen, accepted. the sticking places, to set us free. 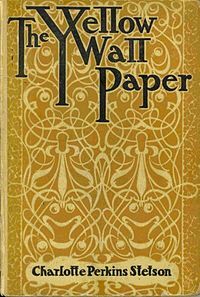 Your beautifully imagined poem made me want to revisit “The Yellow Wallpaper.” I appreciate the effort it took (probably all the energy you had available) to construct it. I wrote a paper on the story in 1998 for a literature class……but can’t remember the details. It will be interesting to see it in the context of a different kind of confinement. It hit me in the middle of a sleepless night that this might just have been what the author was suffering from – there are certainly parallels. So, I reread the piece and borrowed some of her elements. This piece pleased me immensely, although I am sure the audience for it is limited, ha ha. Reblogged this on One Woman's Quest. Loved this, thank you for sharing! I appreciate that you read it. It’s one of my favourite pieces.